You know, the garment stitching is the core process in the apparel and fashion industry supply chain. In apparel manufacturing industry, most garment manufacturers use the assembly line for making clothes and garments. 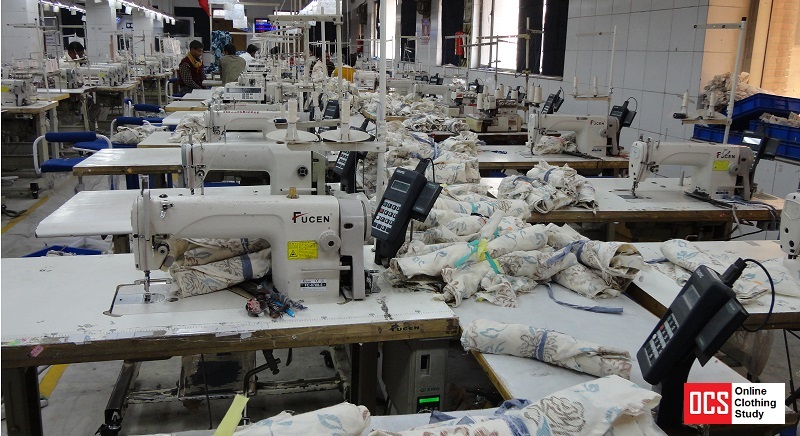 In the assembly line, a number of sewing machines (including different types of sewing machines and non-sewing equipment) are placed in a line according to the process sequence requirement. Garment bundles are loaded at one end of the line and moved from one workstation to another, and finally stitched garments come out from the line. When we talk about preparing a line layout, it means designing the presentation of workstations in an assembly and showing the flow of work from start to end. It can be a simple line diagram. See the following image. The rectangle boxes are indicating sewing workstation. The number marked inside the boxes are indicating operations sequence in the Operation Bulletin (OB) and arrows are showing the flow of work. The line layout is prepared after the operation bulletin is made. There are different types of sewing line layouts. Whatever the line layout one factory uses industrial engineers need to prepare line layout for the upcoming orders. For an example, a production line involved different types of sewing machines, non-sewing equipment, and workstations for manual processes. Each workstation is designed for an operation. When you prepare the line layout, you will see following cases and you will define a workflow on the line layout. Why you prepare a line layout? The line layout helps line supervisors to set the line for a new order in the least time. For new plant set-up, designing the line layout is an essential part. Looking at line layout, overhead wiring, air connection, installation of ironing tables, QC tables and fixture installed. In case a factory produces same product for all the time, still they need to change the line layout depending on the product design. In such cases factory may need minimum change of sewing machines and workstation. 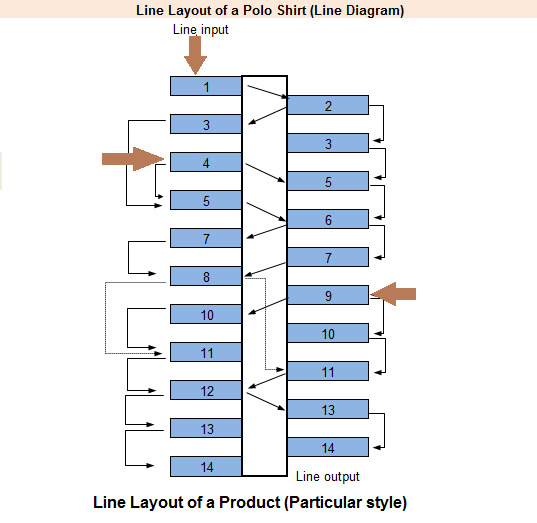 Online Clothing Study: What is Line Layout in Garment Industry? Line layout of a sewing line and its importance. Drawing a line diagram for line layout.